We are almost halfway through the period known as “sefirat ha-Omer” in the Jewish calendar -the seven weeks from Passover leading up to the holiday of Shavuot. Since I’m always preparing for my classes and articles in anticipation of the next holiday, I’ve got the light, dairy cuisine traditionally served on Shavuot on my brain. For many, preparing fish can be challenging and having a reliable go-to kosher fish dish is a must, especially when entertaining (guests really don’t appreciate over-cooked or ill-prepared fish….). This pan-roasted salmon dish is just that sort of recipe – somewhat forgiving, highly flavorful, and a lovely presentation – whether as a main or appetizer. Use the freshest fish you can get. Fresh fish should have no smelly, fishy odor. Always generously season your fillets with salt and pepper independent of whatever sauce is accompanying. Don’t forget or neglect your garnishes or accouterments – a sprinkle of parsley adds color and balance of flavor; a squeeze of lemon adds brightness and often needed acidity. 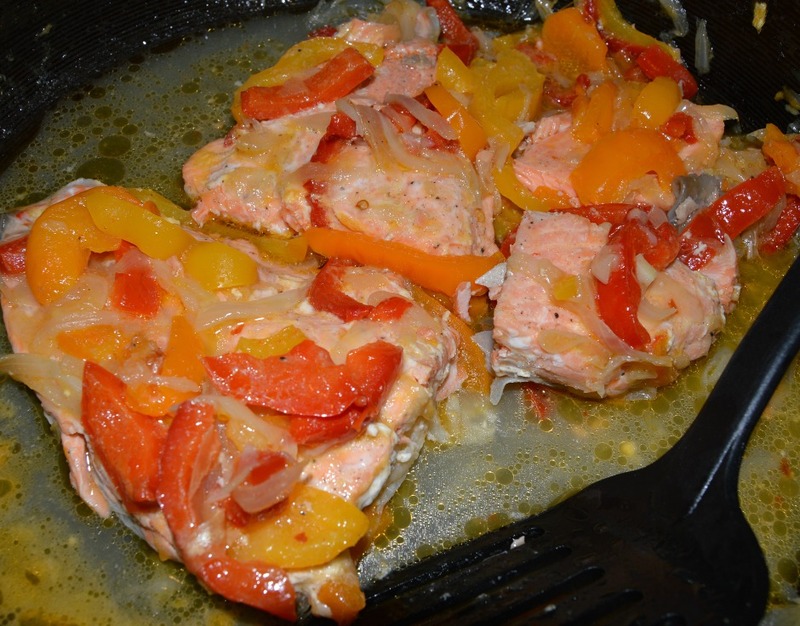 Cider vinegar is an ingredient in the sweet pepper relish in which the salmon is cooked. It has a slight pickling effect, effectively intensifying flavors and preserving the fish. What this means for you: great do-ahead fish choice! If preparing ahead, do be careful and reheat gently. 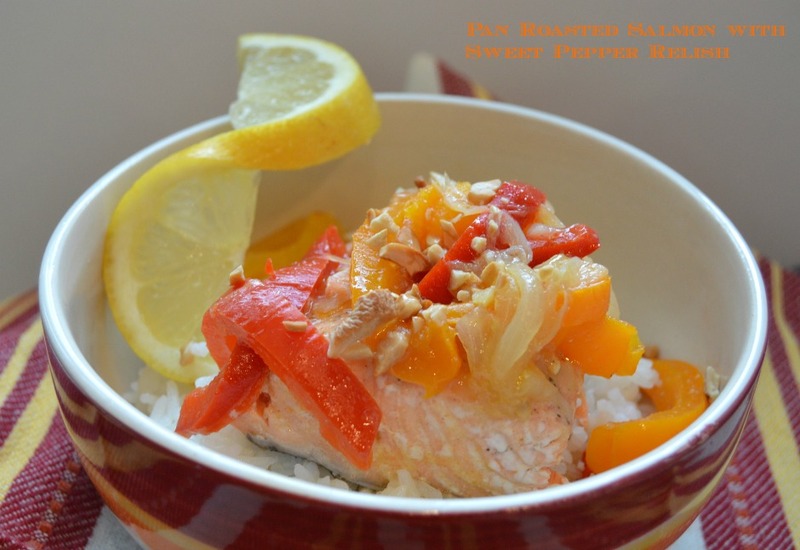 A flavorful, sweet and sour pepper relish is first reduced before cooking with fresh salmon. Serve as a main course with roasted potatoes or rice, or by itself as an appetizer, garnished with lemon. 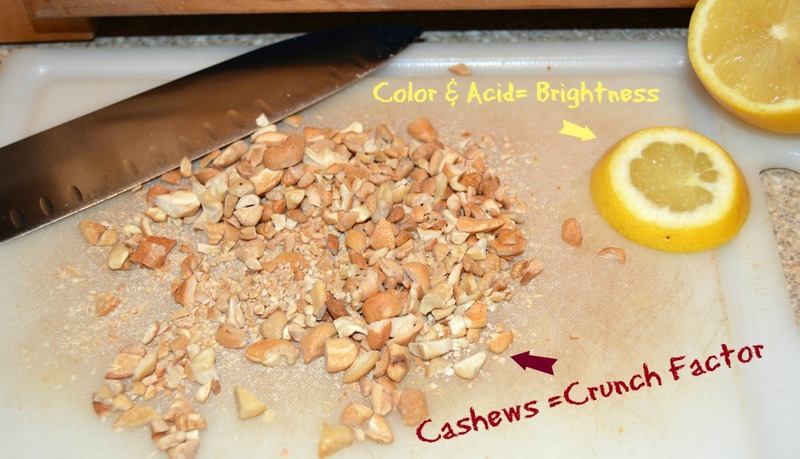 Cashews/peanuts can be pre-toasted for 8-10 minutes in a 325F degree oven. Heat oil in a large, deep skillet over medium-high heat until oil is hot (not smoking). Add onion, peppers, and salt and sauté for about 8-10 minutes – vegetables should be softened. Add crushed red pepper, garlic, and ginger; continue to sauté for another 1-2 minutes. Reduce to medium heat; add honey and vinegar, stirring to blend. Continue to cook until mixture reaches a jam-like consistency, about 6-8 minutes. In the meantime, season salmon fillets with salt and pepper. When relish reaches desired consistency, carefully place the salmon in the pan in an even layer, using tongs to spread the relish to the sides of the pan and on top of the salmon fillets. Cover; reduce heat to low and cook for 15-20 minutes, or until salmon is done (should flake easily with a fork). Plate salmon topped with some of the relish (or on the side if desired). Sprinkle with toasted, chopped cashews or peanuts and chopped parsley. Garnish with sliced lemon. I made it tonight and it was a big hit! My 10 year old said, “mom that was really good, can you make this more often” thanks for sharring this delicious recipe! !